Coban Salatasi or the Shepherd’s Salad is a classic Turkish Salad. The salad does not require any exotic ingredients, is easy to make & is wonderfully refreshing during the summer time. Cucumber, Onion & Tomato combined together with some salt & lemon juice & cilantro is probably the most common salad we would have almost everyday with our meals while growing up. Just for the sake of nostalgia, I like to make this salad ever so often now; but I do it the Mediterranean way a lot of times. I like the warmth of the Olive Oil & with some Feta Cheese to top the salad, it often makes a delicious bowl of lunch for me. Try to chop/dice all the veggies in small & equal size. Chop the onions into small pieces. and grind it with the palm of your hand and with some salt, then drain and rinse it. This is known to take the “bitterness” out of the onions. Combine onions, diced cucumbers & tomatoes, sliced peppers and chopped parsley & mint. Whisk the Olive Oil, Lemon (Or Vinegar), Salt & Pepper & pour on to the salad & toss well. I usually let the salad sit in the refrigerator for a couple of hours for the flavors to infuse really well. Garnish with feta cheese if you want. Lightly toast the sesame seeds & sprinkle on the salad before serving. The Salad may be served with some flat bread, like Lavash or Pita; use the bread to scoop up some salad & the juice. Lisa is hosting the No Croutons Required, the theme being Mediterranean Soup or Salad. Sending this simple Shepherd’s Salad to No Croutons Required. Wow great salad.I too was thinking of Turkish only when the theme was announced.Looks great and very healthy and simple to make Soma.Great Job. WOW! I love the colour. Good Shot! Delicious and Colorful Salad there, looks lovely! Lovely salad and lovely click. Just my kind of salad! make this often and even now have all the ingredients at home. Looks so simple, yet I’m sure it packs a punch. Wow – those chilli peppers must be a kick. I LOVE Mediterranean food too – they really nailed tasty and healthy! very beautiful…lots of freshness too! Bowl of goodness and very fresh looking! This salad sounds delicious! The feta and sesame seeds on top look great! thats really a refereshing salad. Loved the cheese on it!! Looks lovely. This is one of my favorite salads though I have never made it at home. I need to. This looks wonderful! So fresh and vibrant. I know what’s for lunch tomorrow! The colors of this salad are so beautiful, it’s a feast for the eyes as well as the stomach. I love your artistic eye for food presentation, Soma– you make everything look so good! That looks beautiful and delicious!!!! I love all the colors. That salad looks delicious & colorful. The colors are really good!Looks delicious, Soma! 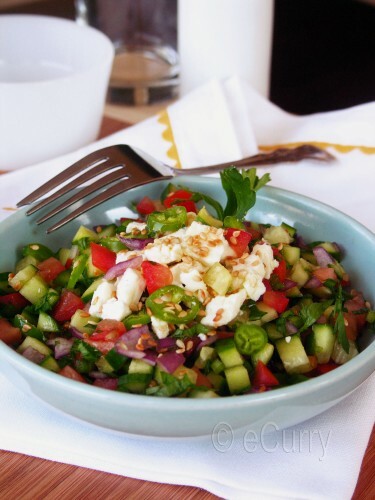 A delicious & colorful salad, sounds great with feta on top! I love Mediterranean food too! The flavours and textures are so wonderful! It’s great salad. We cook the same in Egypt too. I’d like to add soy sauce too. great looking salad and I like the way how it is cut into small pieces. I love coban salatasi. It’s a great companion for meat dishes and fish. In fact, it’s served with any kind of dish at restaurants here, in Turkey. If you have a high quality olive oil to add, this salad gets just perfect! Your salad here looks so colorful and appealing. 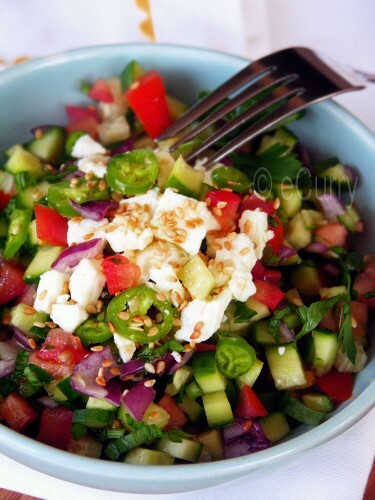 I am a sucker for feta and I am loving those green chilies on top of that salad! Colorful, delicious and easy to make! Great combination! Salad looks and sounds good,sure it will taste great Soma! Love the simple flavours of this salad. Looks like the sort of salads we make here in India. Beautiful picture, love the colors in the salad. 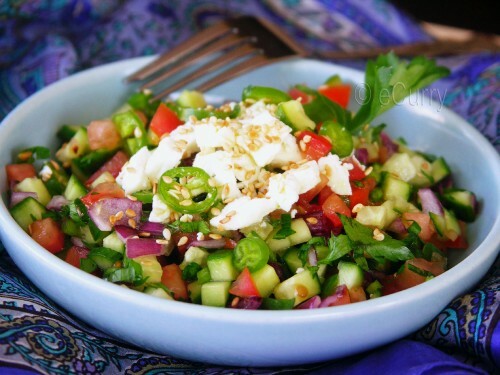 Another great Turkish recipe… This is one of my favorite salads. It’s so light and colorful, I could eat it every day. I’ve never had it with sesame seeds; that’s an interesting addition. I should give it a try. My journey with Turkish food started with Dolma..and then on, I am a regular visitor of Turkish resturants ! Thanks a ton for adding this recipie !! Now, I ca try Turkish salad, in the luxury of my own kitchen !! You have definitely featured the best of the Mediterranean world in this salad, with the feta cheese and all of the herbs. Yum! How I love this salad – I always order it when we dine at our favorite Turkish restaurant. Now I want to snag the last of the good tomatoes (still around here and there) so I can recreate *your* recipe. Adding those tiny bits of zingy green chiles is a great touch, Soma. It’s lovely and that’s why i love it. Thank you!! I never knew. I am no expert in this and my information is on what I eat around then on web. I will update the post with your info:) thank you again.